This is a terrible photo of my second painting that sold last night following the Rhinebeck Paintout. I had to take the photo with a flash and dismal lighting. The color of the sky and background hills is waaaaay off! In spite of the bad photo, I did want to be able to at least show an idea of what my other painting looked like. I love this view from Olana looking toward the Catskills. If there’d been a more dramatic sky yesterday, I’d have done a vertical format instead, or a lower horizon that featured more sky. The tall, relatively narrow tree has a wonderful shape, but showcasing the top of the tree would have left nothing happening on the other side of the painting on this clear, nearly-cloudless day. Cutting out much of the sky showcases the background mountains to draw us into the painting. 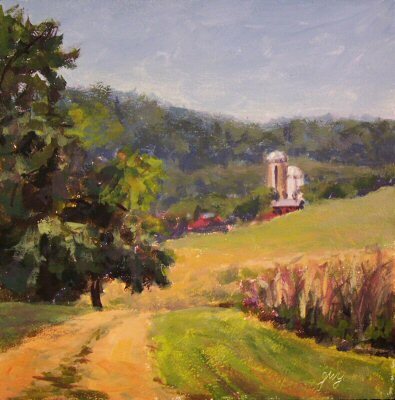 Many thanks to my buyers from last night for sharing my love of the Hudson Valley in art. Today I participated in Barrett Art Center’s Rhinebeck paintout. I went up to Frederic Church’s estate, Olana, to enjoy the beautiful weather and soak up some of his inspiration. I loved the way the tree framed the building, and the way the shadows cast on the side of the mansion and foreground made the light yellow glow. 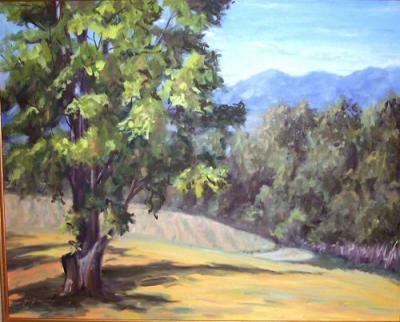 I finished two paintings at Olana today. I’ll post the other one tomorrow. Both sold this evening. 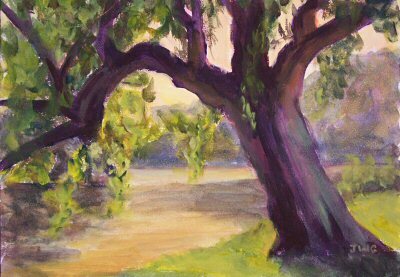 Plein air painting is always so full of suspense. Not only don’t you know how the painting will turn out, but you never know what may happen on the journey and during the process. It’s always an adventure; I think that’s why I’m so hooked! 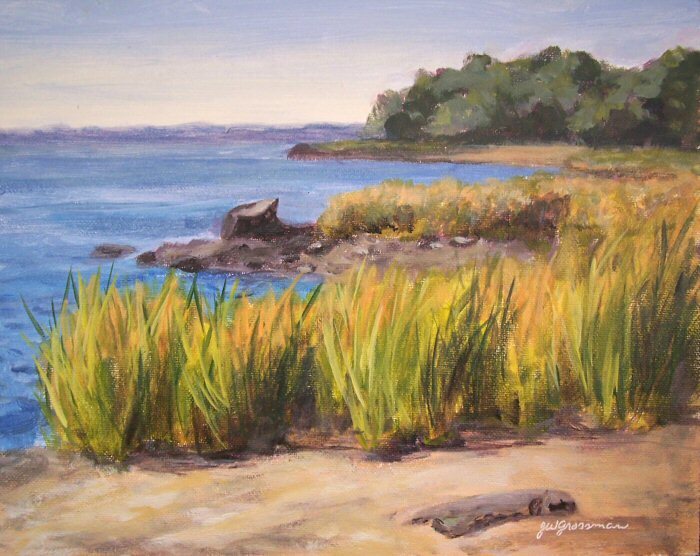 A few days ago when I went to Long Island Sound to paint at Marshlands Conservancy, it was an easy ride, and even the painting process seemed effortless. By contrast, today was a true traffic nightmare, and I felt like I fought for this painting every step of the way! That really took me by surprise. 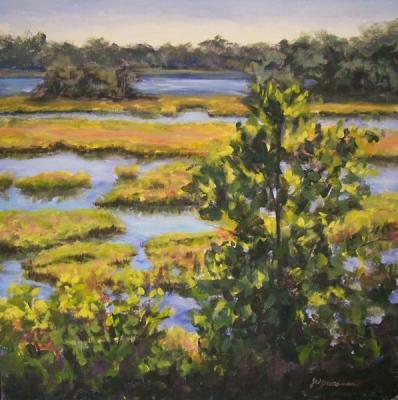 I’ve painted the Constitution Marsh overview from Boscobel so many times that I never thought this marsh view in Rye would give me such a battle. I came home so tired that I had to take a nap! 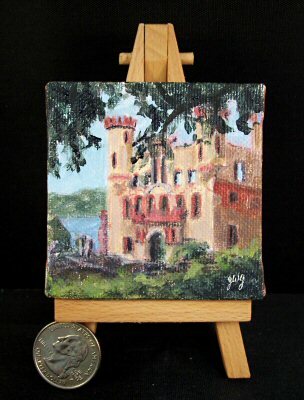 2.75×2.75″, Acrylic on stretched canvas, easel included. Painting will be gift boxed. The castle remains on Bannerman’s Island tower above the Hudson River like something out of a movie. While plein air painting on Bannerman’s Island, I took lots of photos of the views and castle ruins to work from in the studio. This is a view of the Armory side entrance from the path above. The painting is a diminutive 2.75″ square, and sits perfectly on the easel to liven up any spot in your home with a piece of Hudson River history. 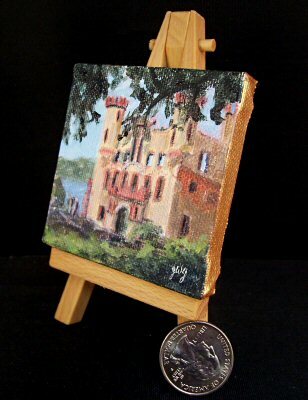 The canvas edges are painted gold as shown below, for the gem-like quality that these miniatures evoke. Although small, these minis take as much time to paint as their larger counterparts. I love the way they look and the charm of the small scale. My show at Ward Pound Ridge Reservation, titled Plein Air Plus, is opening tomorrow night! Please come join me for the opening reception from 5-7pm, to view the show and have a bite to eat. 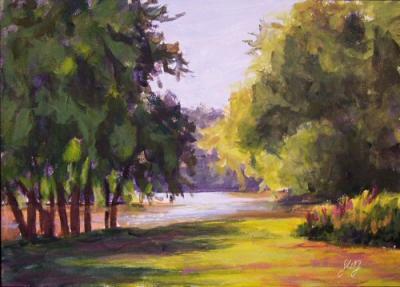 It is at the WPA Gallery, across from the Main Office on the preserve grounds. You’ll see this painting and many others that were done at the preserve, plus a couple of others to constitute the “Plus” part of the title “Plein Air Plus”! This morning I drove down to the Marshlands Conservancy on Long Island Sound in Rye, New York, and spent the morning with the cool breeze blowing and my bare feet in the warm sand. I don’t think I’ve been here for over 20 years, but I sure am going to revisit very soon! The smell of the salt air and the serenity, combined with fabulous views, are truly plein air heaven! This is another plein air painting done along the Hudson River from my favorite spot in Cold Spring, NY. I just can’t get enough of this location! Storm King Mountain is on the left, and Breakneck Ridge on the right, with Little Stony Point jutting out into the river. Watching the huge barges, tugs and beautiful sailboats pass through the middle could become a favorite pastime! The clouds were truly amazing in the morning, and the chroma was so strong that I had to pull out the phthalo blue to get the beautiful almost-turquoise color low in the sky. 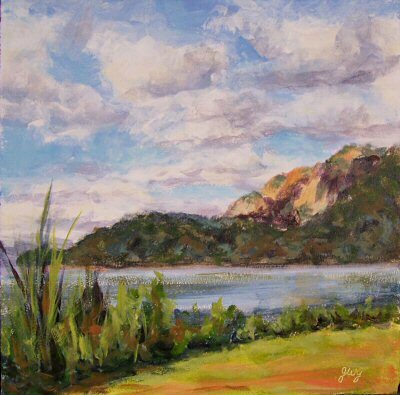 This is a little plein air painting from a spot along the Hudson River in Cold Spring, New York. This was painted on location at Benedict Farm Park in Montgomery, New York. The late afternoon light was absolutely stunning, but I had to pack up to leave just before I was finished with the painting. I added the finishing touches in just a few minutes in the studio. This is a scene that I really wanted to paint on 9/11 on location, but it was raining. 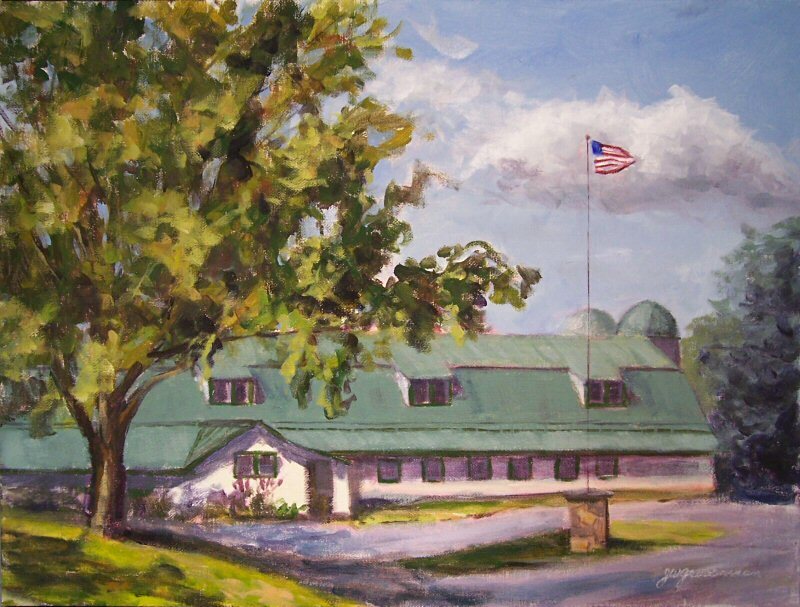 I did an ink and watercolor sketch of this barn with the flag years ago, and I’ve been meaning to go paint it ever since! It was worth the wait; the day was gorgeous. Unfortunately, I just found out yesterday that the future of the farm, currently owned by Putnam County, is in jeopardy. This breaks my heart. It’s a gorgeous location, one of my favorite places to paint, and should definitely be remaining in public hands and open to us all! 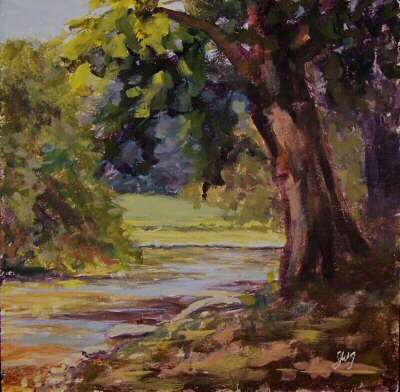 This is another little gem painted alongside the Walkill River in Montgomery, New York. The trees along the shoreline were simply stunning. I couldn’t get enough of them! 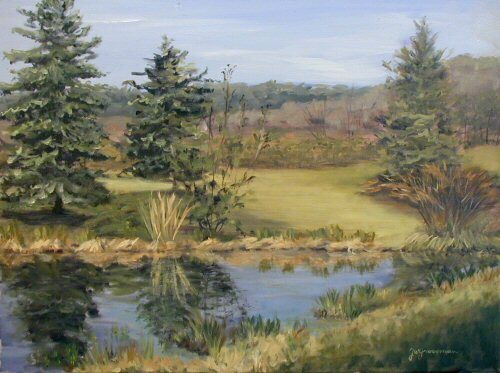 This is the Walkill River, painted from a shady spot at Benedict Farm. 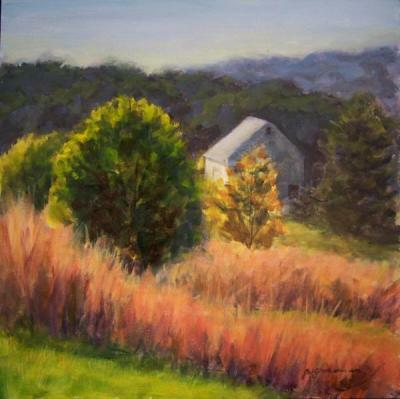 This painting will be in a silent auction to benefit the Golden Foundation for the Arts . I met with a wonderful group of painters at Benedict Farm in Montgomery, New York. I’d never been there before, but I sure am going to return soon. There are stunning spots along the Walkill River, overviews of fields and barns, and lovely paths. 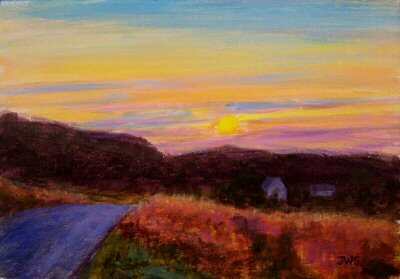 Painted en plein air at sunset at Ward Pound Ridge Reservation, with some touch-ups added in the studio. I went up to Frederic Church’s estate, Olana, to paint and soak up some of that Hudson River School aura! 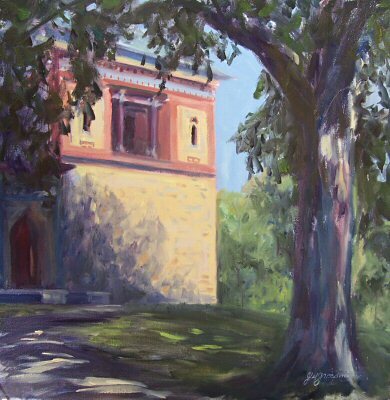 This one was done sitting on the side steps of his mansion, just before sunset. It was cool and breezy, with the glow of the late day light overlooking the breathtaking Hudson view. I’ve been so busy painting that I haven’t had a chance to photograph work and post! I just got home from the beautiful Ward Pound Ridge Reservation. The field grasses are glowing red, some of the leaves are starting to turn, and every view there was simply stunning. This is the old farmhouse on the property that now houses the offices and one of the galleries.